Welcome to this issue #184 of the AbiWord Weekly News. Last week was a purple haze. Lots of MacOS X work and the beginning of BiDi refactoring. Also, it's official, AbiWord 2.0/2.2 will only require GTK2.2. This is the shiznit. Captain Reynolds turns to Zoey, as time passed more slowly than ever before. Her gun raised, she fired. Zoey looks over at the Prince and asks, “How's that for loyalty?” The Prince approaches the Captain's body. When he kneeled down, a sudden burst of thunder crosses the desolate rock, and Inara's shuttle lands so close, that the sudden drop of the nose deals a fatal blow to the Prince. “Damn, woman! Don't you think that was a little close! ?” Mal seemed...upset. That would have been so much better if I had not just written gibberish off the top of my head. → Frank rises to the occasion for AbiUsers on MacOS X and Darwin in general. Coquille and psion are now up and running for our Apple Audience. → Hub also takes the time to make MacOS X more fun to use by adding the Document Comparison dialogue, List Documents dialogue and the History dialogue. And more on the joy of proper cross platform programming, as Hub's magic fingers fix the Document Comparison dialogue. § It would be a tragedy if an application's portability was toolkit dependant. That's the kind of poor designing and evil sock puppet would come up with. § Is Martin working on a secret GNOME Office-based project!? Will it be to the rest of us!? How Soon!? Stay tuned, same ant-time, same ant-letter! → Tomas has begun work to abstract the BiDirectional text control and glyph-shaping. He hopes to achieve to goals: make it possible to use optional third party controls via plugin, like, pango or SIL graphite, and to conform to the Unicode bidi algorithm. Visit the two message for more technical details. § Yes, that's right, you'll nolonger see wheel-abi.so.1. → Hub has announced that he shall nolonger develop the project under Project Builder, but instead, will be using XCode. This resulted from switching a MacOS X 10.2, Jaguar, system to some form of GNU/Linux. Jaguar users will still have the ability to build AbiWord via the ever-lovable autoconf build system. → Stable is now officially locked into GTK2.2, and HEAD has been branched to create a GTK2.4-to-be tree. Anoncvs users may try the new branch out under module name ABI-GSFGTK24-PORT. To encourage testing, you'll find a real purty 2.3-style File Chooser screenshot here. § ME ABC: Minor Errors Already Been Cleaned-up. commit: ewritten backend for TOC with lots more features. → Martin developer Table of Contents at a blinding rate. 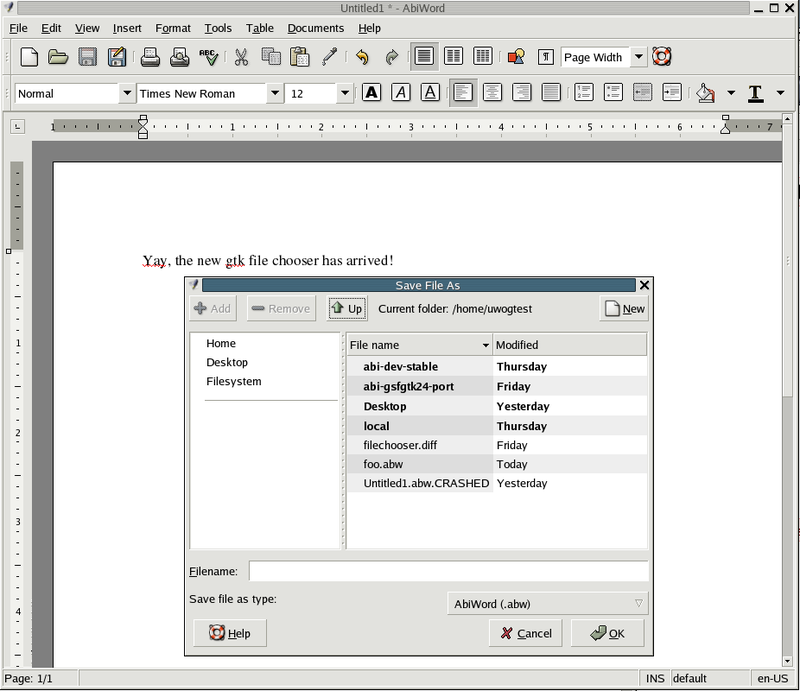 New features include the ability to create arbitrary labels to be placed before each heading (including the overall name for the Table of Contents), the ability to alter the normal configuration of the headings numerical layout (roman/arabic numerals, alphabetical characters, use of parentheses), and optional and configurable text before and after the numbering, plusse the numbering may also be nested. → Ladislav Cetkovsky found a wonderful multi-lingual-spell-checking word processor. Unfortunately, there was some difficulty finding a Romanian dictionary, especially as seeing AbiWord/Enchant defaults to ispell dictionaries. Thankfully, Alberto Cabello Sánchez did find a very relevant project here. § More users helping users; who doesn't love that!? → If you're a Windows user, and, like Loran, abiword files do not automatically open for you when double-clicked, there is a simple remedy. During the AbiWord install, there is one point where possible file types may be associated with the AbiWord application, this also include abiword files, those with the extension .abw. You only need associate the .abw file extension with AbiWord; this can be done by re-installing AbiWord. § I wish I knew how to do that in Windows; unfortunately, my not using it prevents me from knowing more with regard to this. Frank J. Franklin 21 Much work focused towards the Darwin platform. Marc Maurer 15 Backports and building requirments. Tomas Frydrych 69 Bidi refactoring. Hubert Figuière 51 Lots of work on MacOS X, including THREE new dialogues. Martin Sevior 38 Tables and Table of Contents! Marc Maurer 24 Building updates and plugged Linus' book. Francis J. Franklin 18 Much work focused towards the Darwin platform. Mark Gilbert 4 use correct type when available for 64bit int instead of strange gnuc ext. → General: use correct type when available for 64bit int instead of strange gnuc ext. I think I broke something because Frank has the same output to both trees. The market has dropped from its record high last week, but has not entered the negative. Alan Bluespan, unsurprised, explained that it would have been difficult to maintain last week's numbers at even 10% for much longer than a month, due entirely to the concentrated effort made by the limited number of market players. Louis Bugkeyser, however, went on to note that anyone can participate in the market; for more details, see this guide. Nadav died of a massive heart failure at the age twelve. Maybe I should only put up categories where stuff actually happened. I wonder if I will ever hear from these people again. This week, the only non-gtk requirement for Gnumeric is gconf. Of course, if you don't care about the details and would rather see the general pretty bits, the charting engine is officially under the “smooth running” phase of development. Also worth noting for the drool worth is SamuraiMike's radar plot implementation, which is expected to be incorporated relatively soon. Watch out for 1.2.6 Real Soon Now™. Nnnothin', I hope. I may have missed somethin'. Nothing YET in Criawips, but keep watching! A new website kicks off the beginning of the changes in how Conglomerate presents itself. While everyone with access begins playing with the new site, Dave asks, based on how people are using it now, “What is Conglomerate?” Dave considered stepping away from CMS-like functionality and pushing client-type end user concept. 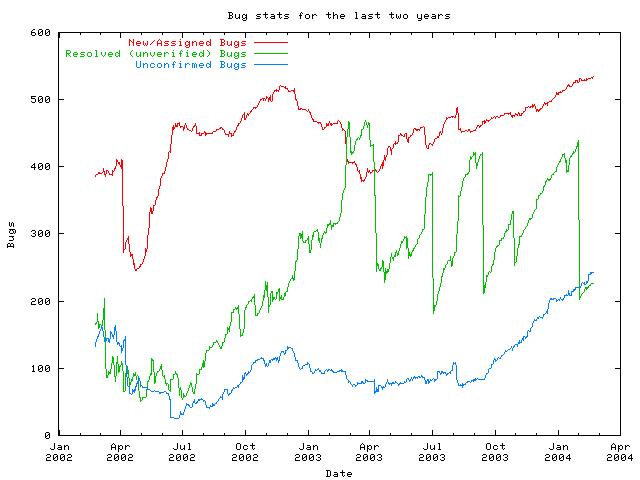 However, the idea of using a version control system for an xml-like-based website, as discussed last week in Sean Wheeler's thread “Save a Copy?,“ appears to be a relatively common, making Conglomerate still useful in this direction to many people. That thread begins here. Trying real hard with limited time. Once I'm all caught up. Alberto Cabello Sánchez has proven a helpful user this week, and therefore, gets the BlueAnt Award for Exemplary Competence. Congratulations, Alberto!